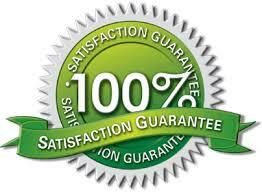 Olympia DGM provide Driveway Cleaning and patio cleaning in Solihull and across Birmingham. Our driveway cleaning Solihull team clean many types driveways and other hard sufrace areas. We are fully insured and highly experienced to carry out high pressure driveway cleaning work in Solihull and Birmingham, we also provide decking cleaning in Soilhull and Birmingham, not leaving your property until you are totally happy. Over the years we’ve cleaned hundreds of driveways in Solihull and across Birmingham and we know that keeping your driveway maintained increases the value of your property. Whether you are selling your property or just want your driveway cleaned and freshened up, look no further than making a booking with our Driveway Cleaning team in Solihull. We can also provide an additional protective sealant for you block paving, applying our professional driveway cleaning sealant will help prevent the further growth of lichen, weeds and moss, along with providing a protective barrier against oil and other unwanted stains which will reduce the overall driveway maintenance time. We are also able to remove over 90% of oil stains by treated the area with a pre-cleaning substance which in most cases gets rid of those nasty oil stains. 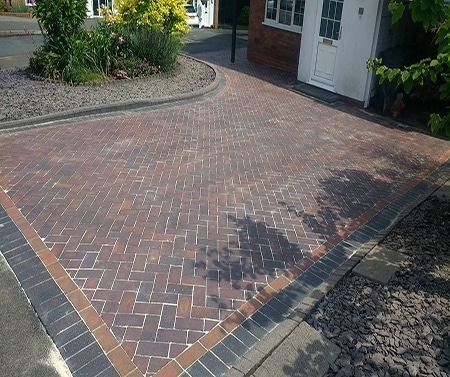 Once the stains have been removed and the driveway process has been completed we brush dried kiln sand into the joints of your block paving drive giving which gives the area a new vibrant look. 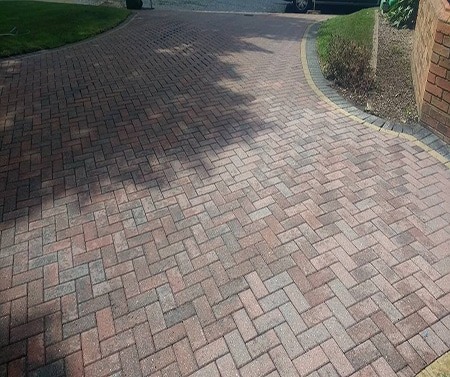 Our block paving cleaning service in Solihull will leave your drive sparkling, saving you time and money. Using our state of the art rotary cleaning method, our driveway cleaning process will not just get rid of all dirt, weeds and debris in no time, it also keeps the water splashing down to a bare minimum, completely remove all unwanted grime leaving your driveway as it as first laid. For a professional driveway cleaning in Solihull please get in touch for a free quotation. We will shock you with the great results which we can achieve at a great price !